I adapted this recipe from my paleo version on my blog to a vegan recipe. It passed the omnivore test They have a wonderful flavor that all in your household will love. I like that they are not too sweet. In a large mixing bowl whisk together all the dry ingredients. In a large liquid measuring cup whisk together all wet ingredients. I like to top the pancakes with the blueberries instead of adding them into the batter. I like to do this so that there is an evenly distribution of blueberries. By using this method the blueberries do not sink to the bottom of the batter. It is time to flip the pancakes over when bubbles begin to form on the top of the pancake. Serve with your favorite topping. Eat. Enjoy. It seems like forever since I have made pancakes. My husband was so ecstatic that he said ,” We have pancakes in the house again.” Frankly, I was pretty happy about the idea too. I made some oven bacon to go along with the blueberry pancakes. Mmm, breakfast ( in this case lunch) heaven. I have to admit I sort of miss going to a pancake house and getting pancakes. It is a trade-off, either I feel good, or have my head in a toilet. Well, feeling good wins. Now I have the pancake house home and enjoy every minute. In a large bowl mix together the dry ingredients: flour, baking soda and salt. In a large measuring cup mix until well combined: almond milk (1/3 c), eggs, butter, honey and vanilla. Pour wet ingredients into dry and whisk until well combined. 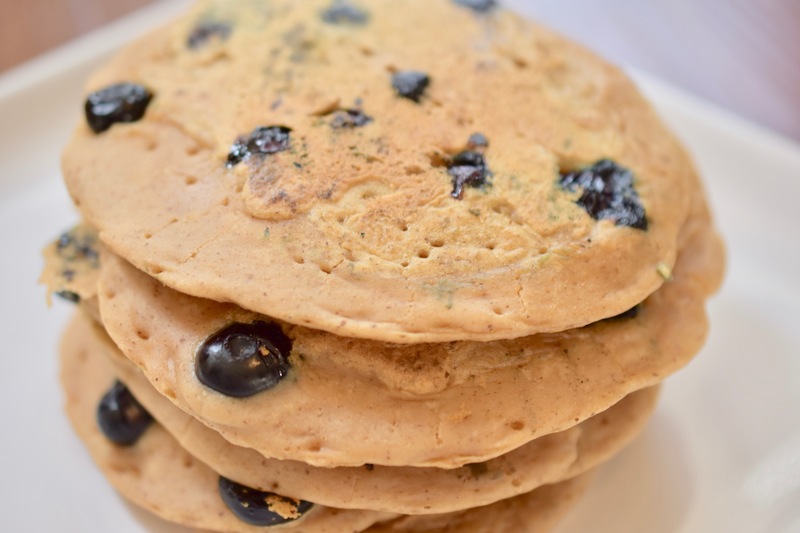 Set aside – you will be adding more almond milk just before pouring your batter onto the griddle. Heat griddle or skillet. The batter will be thick, Add more almond milk until batter is to your desired consistency. Pour batter onto griddle; sprinkle blueberries onto batter. Note: Sprinkling the berries work better for consistency. The berries can sink to the bottom of the batter. The pancakes are ready to flip when little bubbles begin to appear. Just to be sure, double check color of pancake. Combine both maple syrup and blueberries into a glass measuring cup. With a fork mash some of the blueberries so that they release some of their juices. Stir. Microwave for about 30-60 seconds. Pour of buttered blueberry pancakes. Serve. Eat Enjoy. Here is another recipe that I am excited about. Pancakes. These might just become my favorite pancake recipe. 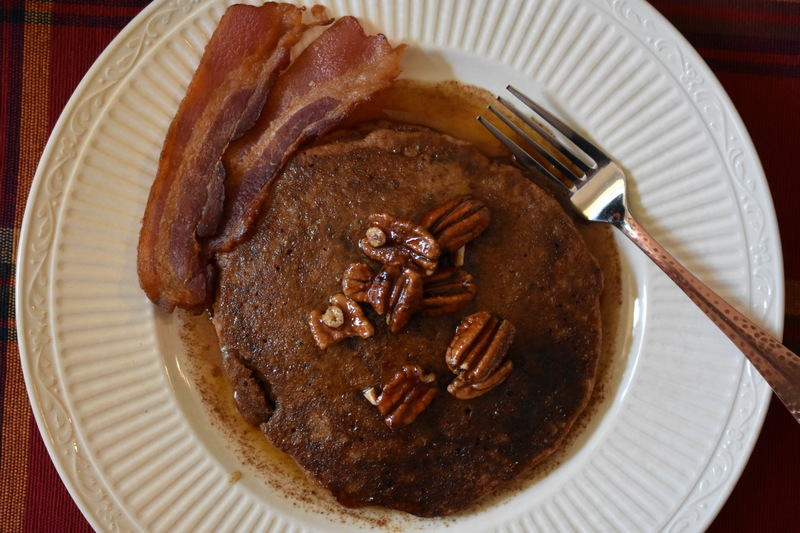 So if you do not eat grains or gluten this recipe will make you happy. 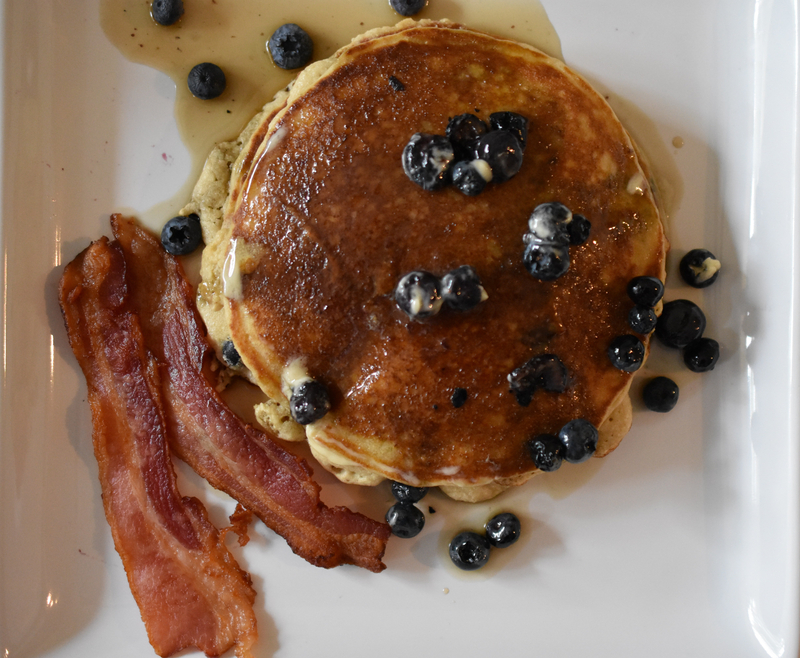 Pancakes are good for breakfast or breakfast for dinner. It is one of those comfort foods that you probably do not have very often, but now you can have it whenever you feel like. Whisk together dry ingredients together in a medium mixing bowl. Add remaining ingredients and mix until well combined. Let rest while griddle or skillet is heating. 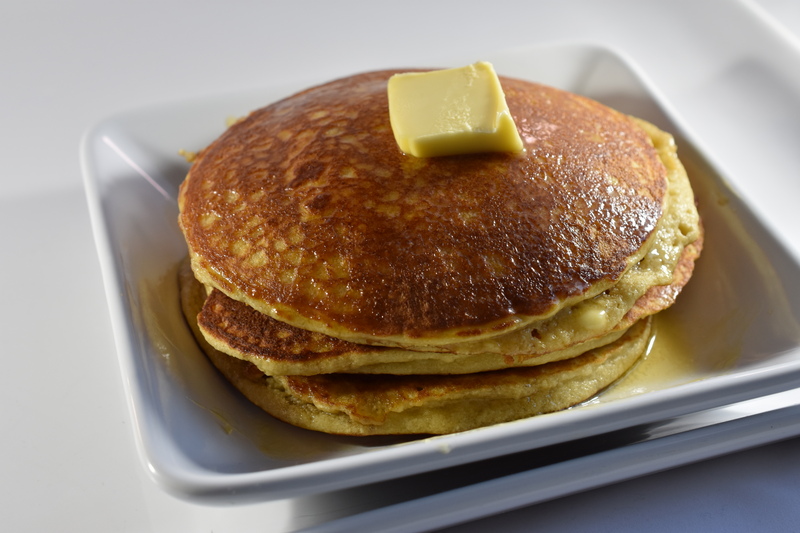 Lubricate griddle/skillet with cooking spray Pour out batter to desired size of pancakes. When bubbles form on pancakes it is time to flip the pancake over. Top with maybe some Blackberry Jam ,fruit or warm maple syrup. Down here in Florida the weather does not get very cold. Thank goodness, because me and the the cold do not get along. However, this morning it was a little chilly. I know it is a matter of perspective, but for us down here it was chilly. I felt like pancakes, something warm and filling. I topped these with a warm fruit compote. Yummy is the word for these. Whisk the applesauce and eggs; add one egg at a time, beating well with each addition. Add vinegar, vanilla, and ghee. Sift the coconut flour, tapioca flour, baking soda, cinnamon, nutmeg and salt into the wet ingredients. Allow the batter to rest 15 minutes to let the batter thicken. Heat a large skillet over medium-low heat. Grease the skillet and spoons the batter into the skillet. I usually use 1/4 c. When a few bubble appear, flip the pancakes once to finish cooking. Repeat until you have used all of your batter. Serve with butter or ghee, fresh fruit or warm maple syrup. Eat. Enjoy. If you could have chocolate morning noon and night, these waffles are for you. These are great for breakfast, dessert, a snack. Oh, the possibilities are endless. They are so easy to make, and easy to freeze. Make a double batch so you can freeze some for a quick bite. I am. Preheat waffle iron. In a large mixing bowl, whisk each egg into bowl, then add pumpkin, vanilla, and syrup. Transfer dry ingredients into sifter, and sift into wet ingredients. Whisk all ingredients together (except almond milk). 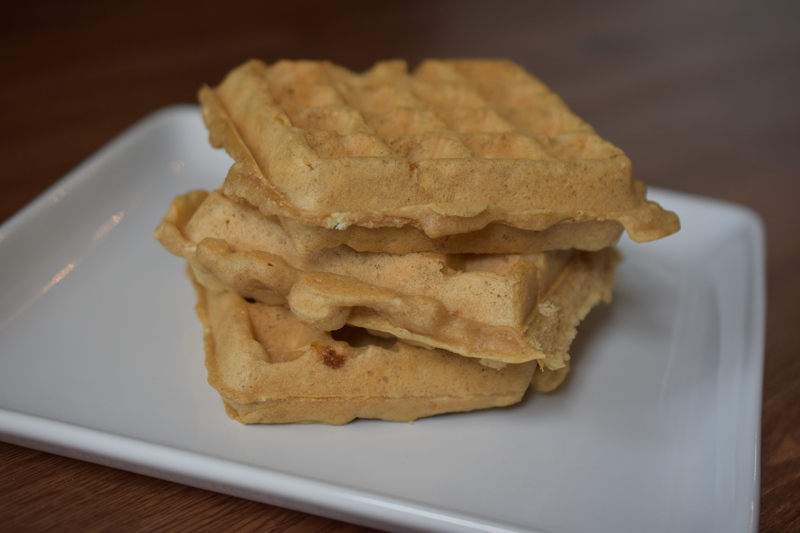 Add almond milk a little at a time, making it into at the consistency of conventional waffle batter. Cook waffles according waffle iron instructions. Repeat. Serve waffles with maple syrup, and butter or ghee. Double freezer bag any leftovers, and freeze. These were the first pancakes I made without any grains. I can remember being so excited about this recipe, thinking I was able to have pancakes without any ill effects. Happy Dance going on right now just remembering. If you are just starting your journey of grain-free, give these a try and get your happy dance ready. Whisk bananas until creamy, add eggs one at a time, whisking with each egg added so the bananas and eggs are well incorporated. Add vinegar, ghee, whisk together. In a separate bowl sift coconut flour, tapioca flour, baking soda, and salt. Combine wet and dry ingredients. Make sure the ingredients are well incorporated. Allow the batter to rest about 20 minutes. This is necessary for the batter to thicken. Heat a large skillet on medium low heat. Grease the skillet and spoon out batter into the skillet. I use a 1/4 c (it makes about 6 pancakes) Sprinkle blueberries on top of batter. When bubbles start to pop up it’s time flip that baby. Repeat. Eat. Enjoy. Mmmm.